La Transhumancia is one of Madrids lesser known spectacles in which the farmers from around Madrid province exercise their right to move their livestock between grazing areas. Based on the traditional routes used by Neanderthals to move their livestock the tradition was succesfully revived in 2001. Of course nowadays the route happens to pass through the center of the city! La Transhumancia - What is it? Each year on the 20th November (or the Sunday closest to this date) farmers move their livestock (predominately sheep) between the higher grazing land of the mountainous Leon (to the north of Madrid) and the flatter, warmer Exteremadura to the south of Madrid. This allows the animals feed throughout the winter whilst the pastures in the North are covered in snow. 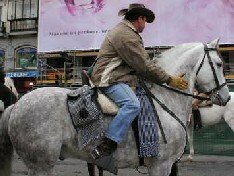 In reality farmers from all over the province of Madrid (and further afield) each bring with them a few of their animals and turn it into a party! Of course this only happens after the serious work has been completed. 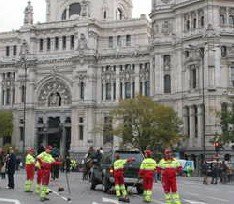 Puerta de Alcala - Fun & games as they go around the roundabout! Although La Transhumancia in Madrid is the most famous they occur all over Spain as farmers guard their livestock through winter. Many small villages will have their own parade although in 99% of cases it is work more than fun! Of course there is always the obligatory party when the job is done. 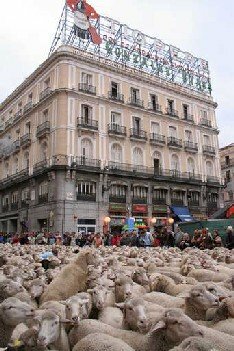 The sheep parade through Madrid city center is one that attracts a large crowd and for city dwellers, especially the children, it is well loved... Not so by the army of street cleaners who follow along behind the animals!! Thankfully the reverse route in the Springtime is now carried out by more conventional means. Smaller roads outside the city or transport being used! If you are not visiting during La transhumancia why not check out the other cultural aspects of the city?